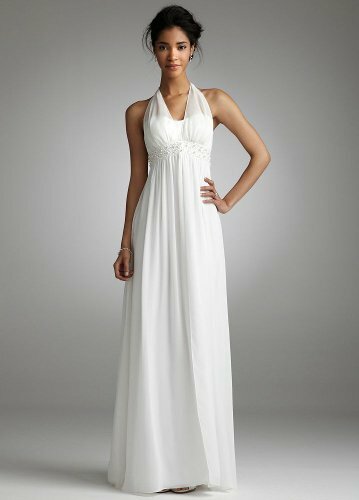 Elegant chiffon gown is effortlessly chic. Illusion halter neckline is delicate and feminine. Beaded crystals and pearls adorn the empire waist for a touch of sparkle. Chiffon over charmeuse fabric gives this gown an ethereal feel while split front creates a flowing look. Soft goddess silhouette is simply stunning. Floor length skirt. Invisible back zip. Imported polyester. Dry clean only.